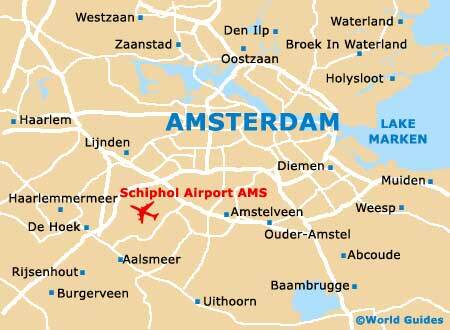 Amsterdam, The Netherlands' most important city, is resplendent with a rich array of imposing landmarks and monuments. Many of these offer historic and architectural interest dating back hundreds of years but are nonetheless in remarkable condition. Designed by P. J. H. Cuypers, who also designed the renowned Rijksmuseum, this red-bricked railway station was completed in 1889 and is located in the heart of the city. 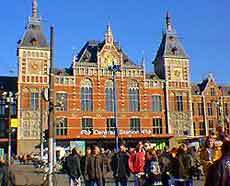 Nowadays most visitors to Amsterdam arrive at the Centraal Station, and with its imposing twin towers, this Dutch neo-Renaissance building is a very important transport hub with buses and trams also terminating here and a general a buzz of excitement pervading the area. Facing the Royal Palace is the imposing facade of the Magna Plaza. Built originally as a post office, this palatial building now offers luxury shopping with numerous elegant stores housed in a fairy-tale setting. Serving as the Stock Exchange until 1984, this building is now an exhibition and conference centre as well as a concert hall and home to The Netherlands Philharmonic Orchestra. Although refurbished, the original decoration of the exchange has been left untouched and the building is a prime example of Dutch city architecture. Koninklijk Paleis was originally built as a town hall in the mid-17th century by Jacob van Campen and turned into a palace by Napoleon Bonaparte's younger brother, who became king of The Netherlands in 1808. This aesthetically severe-looking building features one of the finest ceremonial halls in Europe. The Burgerzal (Burghers' Hall) was the illustrious venue for the ball which was held to celebrate the marriage of Princess Beatrix to Klaus von Amberg in 1966. No longer used as a palace, the Royal Palace still caters for official royal functions, gala dinners, exhibitions and state visits. This semicircular fortress tower which forms part of the old town walls derives its name of 'Weepers' Tower' or 'Tower of Tears' from the fact that sailors' wives came here to say goodbye to their husbands as they embarked on long voyages. A bronze plaque commemorates the English navigator Henry Hudson who sailed from here in 1609 and subsequently gave his name to the North American river. Built on the site of the 15th-century Regulierspoort, a city gate which was burned down in 1690, this tower was built by Hendrick de Keyser and received its name when the national mint was transferred here during the French Occupation. During the German Occupation of World War II, the Nazis used this theatre as an assembly point for Dutch Jews en route to the concentration camps. Since 1962 the theatre has been a memorial to these dramatic events with an eternal flame and Star of David emblem carved in granite as well as a list of the families who passed through here. A small memorial garden, situated behind the museum, provides a quite haven.